A cappella commentators Gail (Elizabeth Banks) and John (John Michael Higgins) are following Beca (Anna Kendrick) around, making a documentary on the group after they won the world championships. Beca, now a music producer isn’t happy with her job, so she quits. She and Fat Amy (Rebel Wilson) meet up with Chloe (Brittany Snow) meet up with the other Bellas to go to a reunion with Emily (Hailee Steinfeld). When they realize the reunion was with new members of the Bellas and not the old crew, they admit they all miss the a cappella life and want to get back into it. Aubrey (Anna Kamp) says she can get them to join a USO tour through her dad. Excited at the chance to escape their mundane lives, they all jump at the chance. That excitement grows when they learn the tour is actually a competition to determine who will be the opening act for DJ Khaled. Up against Evermoist (Ruby Rose, Andy Allo, and Venzella Joy), Saddle Up, and DJ Dragon Nutz (DJ Looney), they face competition like they have never seen. Their usual tactics to intimidate their competition don’t work. Add in Fat Amy’s long last father and things get complicated for the Bellas. Their one last hurrah isn’t going exactly as planned. 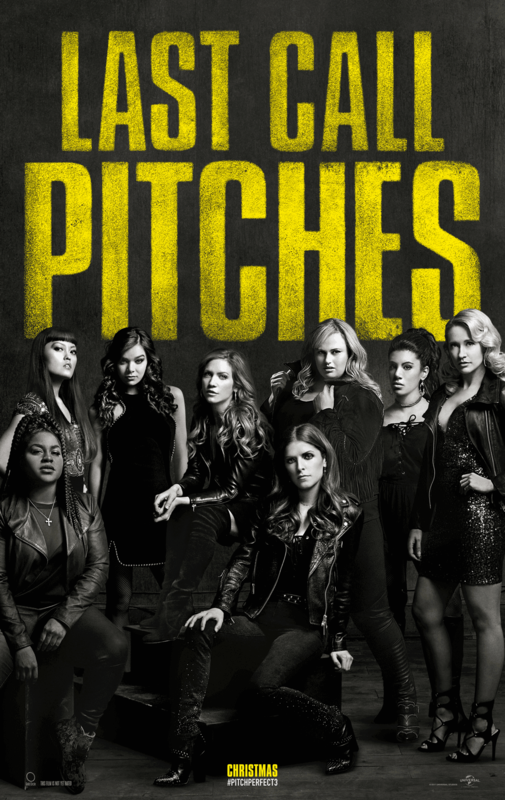 With the tagline “Last call pitches,” Pitch Perfect 3 is a fitting end to the trilogy and neatly wraps up the story. All of your favorites are back. Anna Kendrick, Brittany Snow, Anna Kamp, Rebel Wilson, Hailee Steinfeld, and the rest of the crew reprise their roles as everyone’s favorite a cappella group. The Bellas long for the fantasy world they lived in rather than their adult lives. One even mentions that they need the tour to be a competition because they don’t know how to live without one. It’s fitting and a sly nod to the ridiculousness of the whole thing. Their main competition is a band called Evermoist, headed by Ruby Rose. I had no idea Ruby Rose was a recording artist, so I was quite surprised by her vocal talents. John Lithgow shows up as Amy’s dad. He has been absent for the majority of her life, and decides now is the time to get back into it. Since Amy is from New Zealand, Lithgow, as her dad, has a New Zealand accent as well. It’s a little distracting at most of the time. When Pitch Perfect does what it does best, the singing competitions and riff-offs, the movie is on point. Honestly, that is the only reason to watch these movies. Apparently, someone decided the movie needed some sort of plot line to give the story a little depth. Enter John Lithgow. He is a gangster always on the job. He shows up because he finds out Fat Amy has a sizable bank account waiting for her. The whole story line is unnecessary, and a little too over the top, even for a Pitch Perfect movie. If they had just stuck to the USO tour/DJ Khaled competition, it would have been a better movie. The Pitch Perfect movies are a guilty pleasure of mine, so I was looking forward to a proper send off to the franchise after a somewhat disappointing Pitch Perfect 2. It does give the story a decent ending, but it isn’t quite up the level of the original. That said, if you have watched the first 2, you should definitely see this one to wrap up the story. When it isn’t trying to take itself too seriously, it is a fun film.